I used to work at a hospital. It was a pretty dangerous place. Sharp objects. Strange chemicals. Zombies. Ok, maybe there weren't zombies... that I know of... But in Zombie Doctor, the zombies are definitely there, and they're the doctors, themselves! In the game, players are looking to keep themselves from becoming the undead, while trying to get their opponents to turn. Hack off body parts or look to regrow them. Be the last one breathing and win. The game is up on Kickstarter now. 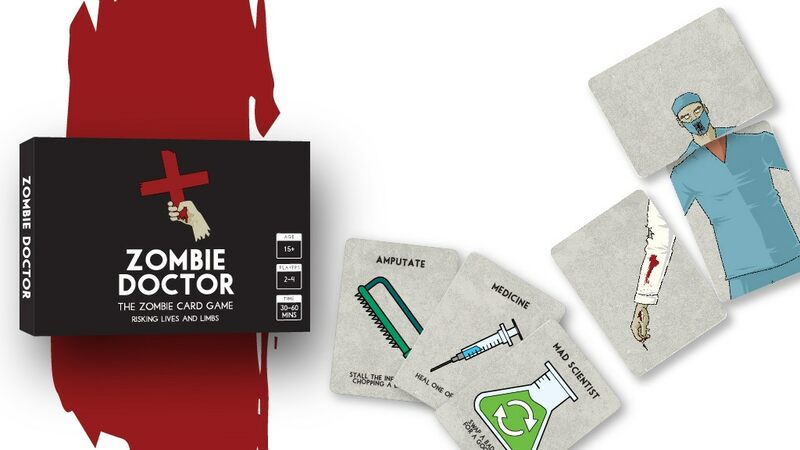 Zombie Doctor is a fun and frantic card-turning game. Amputate, reattach and swap limbs in a desperate bid to stay alive. It's your turn not to turn! The game is designed for 2-4 players (preferably 4), lasts for around 60 minutes and is suitable for ages 15+, due to the comic zombie gore. It's small enough to fit in your pocket and is suitable to play at parties or if you have a spare hour with friends and family. The game is easy to learn but the elements of luck and strategy will keep avid board gamers entertained and challenged.